Cheeky bride cake topper. Traditional cake topper from the front with a cheeky view of the bride from behind. Bride featuring beautiful glitter detail on dress and lace fabric veil. 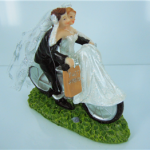 Just married push bike cake topper. Bride featuring beautiful glitter detailing on dress and lace fabric veil. 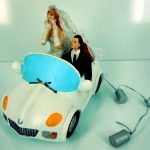 Car cake topper with ‘Just Married’ sign on back, plastic with fabric veil. Approximate dimensions at maximum points – 12cm long (plus tin cans trailing out back) x 8.5cm wide x 9.5cm high. 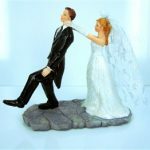 Runaway groom cake topper. Bride featuring beautiful glitter detailing on dress and lace fabric veil.